Is a serialVerionUID required on abstract classes? … we’ll get a “java.io.InvalidClassException”. If we do the same thing, but define a serialVersionUID in the abstract base class, the exception would not occur. The reason for this is, that if a serialVersionUID is not explicitly declared, the JVM will calculate a default one, “based on various aspects of the class” . This is a great mechanism, at first glance it even seems to be better than creating the id manually — if the class changes, these changes are automatically reflected in the generated id. But, this mechanism can differ based on the VM If you would run this example on one VM and then try to de-serialize the same “sub.dat” file with a different VM, without modifying the base class, it is possible that you would get an “InvalidClassException”, simply because the VM uses a different mechanism to calculate the default serialVersionUID. This is why it is recommended to manually declare the serialVersionUID. However, this also means that, if we change a serializable class and thereby make it incompatible with previously serialized instances, we have to update the serialVersionUID! Now if we think about software maintenance and data integrity, there should be a way to migrate existing serialized data to new versions of the serializable class. I’d be interested to know if there is an official recommendation for this, but didn’t investigate further yet. I’d be interested to know what others think about this, so please feel free to comment! Eclipse error message: "Cannot complete the request. This installation has not been configured properly for software updates!" 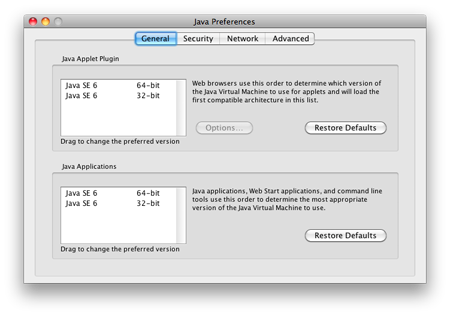 To fix this, you need to go to “Preferences > General > Capabilities” and check “Classic Update”. Afterwards you should be able to select “Help > Software Updates > Find and Install…”. I wasn’t able to find much on the internet, but this post on an Ubuntu forum finally brought the solution. And that is the big news about it, since a 32 bit version of java 6 didn’t previously exist for OS X.
Update: This post refers to OS X 10.5 “Leopard”, if you are using 10.6 “Snow Leopard”, you might want to consider reading my post “Java and Snow Leopard” instead. I just started using my Mac as a development machine and thought I’d share some of the issues and solutions I came across. I’m using Java 6, Tomcat 6, Eclipse 3.3.2 (Europa), hibernate 3, Spring 2.0.3 and tapestry 1.4.5. Now the title of the console in Eclipse revealed the problem, the Sysdeo plug-in was using version 1.4 of the Java RE. The thing is, I didn’t notice this until I tried a whole bunch of other stuff… which cost me quite a bit of time, but also helped understand a few things better.